Sky is a registered architect and Senior Project Manager at DSK. Originally from Hawaii, his knowledge and creativity in residential design and master planning contribute to the Firm’s Caribbean complex projects. Sky is leading a comprehensive Island redevelopment, post Hurricane Irma, in the British Virgin Islands. 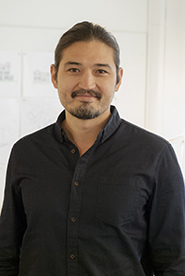 Sky’s background in academia, including research on architecture and urban design at MIT and Harvard GSD, supports his management of projects from concept design through construction administration.​ He draws on his experience in Japan, working in hospitality architecture and post-disaster reconstruction efforts. His work with local communities in Tohoku on community-oriented city planning for resilient coastal reconstruction was presented and published as part of the 2018 Venice Biennale Architectural Ethnography exhibition. Sky has a Master in Design Studies from the Harvard Graduate School of Design, and a Bachelor of Architecture degree from Southern California Institute of Architecture in Los Angeles, CA. In his free time he enjoys sailing, camping, and picnicking around New England.